Having knitted a lot of thing, we learn from experience. We learn that sometimes things have to be modified. I have had to modify some of the knitting for this Cardigan, specially the Collar Bands. 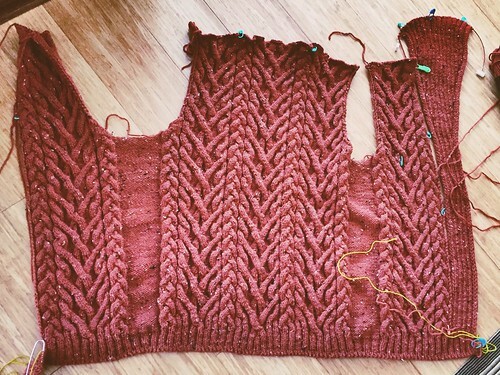 I do have the sleeves for the cardigan already done, I am almost at the point of finishing this baby. I will finish the right side collar band. In the picture is on the left. This is actually the buttonhole band. At any rate this is my latest work and I will be trying this new technique using this video for doing a grafting on a ribbed piece. It should be very interesting. This below is a great video to help you out. This will be a video that I will use and review many times.